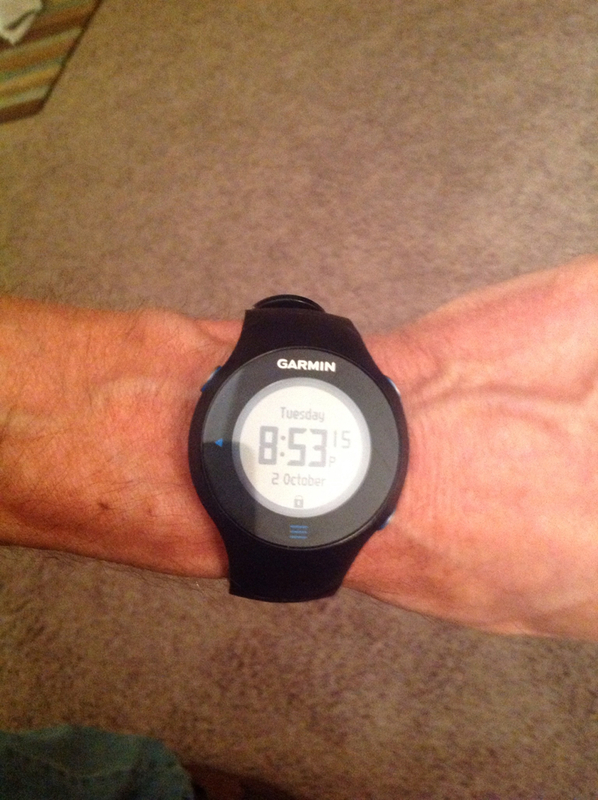 For my 40th birthday my wife got me, among other things, a Garmin Forerunner 610. I have never done a product review before and decided to do this one because after using the watch a single time I could see how much potential it has as a training tool. What can I say, when something positively impacts my life I want to share it so that someone else may benefit too. Instead of a single post however, there is so much that this watch does that the review will actually be a multi-part post of at least two and maybe more. It's hard to say because I find this watch more useful every time I run. A few key features that I want to hit in this post are the user interface, the GPS, and the lap/split functionality. First off, the user interface is very well done. The 610 is a touchscreen device and initially I thought that the touch interface was going to be problematic because it didn't seem responsive enough until I read the manual and followed the manufacturers recommendation on how to interact with it. Unlike most touchscreen devices we are used to the 610 is designed to respond to touches by finger tip instead of the full finger pad. Once I read that the interface became much more responsive. I have even used this watch several times with gloves on. The performance is no different and that will be valuable come this winter. The main components of the user interface and menus seem very intuitive I didn't need to read the manual to find where to go to start running, to view past runs, or to set up basic information. Some of the more specific things in the interface didn't quite make sense to me until I fumbled around. Like how to turn off the auto-scroll feature during a run. Not to get to far off track but the auto-scroll feature scrolls through the various training screens. I thought it would be nice so I turned it on and found I didn't like it. I wanted to turn it off but couldn't get it figured out while I was on the run. Still, I never needed the manual, just a few seconds to think about it. Speaking of the training screens, the 610 can have up to four screens that display data about your run however you want to set it up. I have found for me the default set up is just right. During a normal run the primary screen I use is the main training screen that displays elapsed time, the average pace for the current lap and the total distance. I occasionally flip to the time of day screen and the heart rate monitor screen and flipping through the screens couldn't be easier, just swipe on the screen left or right. Being able to see the screen and make out the data is very important. You would think that goes without saying but when using the back light on my previous watch the smaller data displays were very difficult if not impossible to make out. How the back light affects the display is crucial to me as I run almost exclusively in the dark. The 610's back light causes no problems what-so-ever because all of the data is displayed large enough to make it out even while running. Furthermore, the back light uses the right color/brightness combination so that it actually makes it easier to see rather than harder. On that note, one very useful feature for me on this watch is the "always on" back light. The back light can be set to stay on a certain number of seconds after pressing the light button or to stay on until you press the light button again. For me, leaving the light on allows me to just glance down to see where I am and refocus on my running. The 610 is a GPS enabled watch and the technology is built right into the watch itself meaning no external GPS receiver to lug around. Even with that the watch is very comfortable to wear and weighs an acceptable 2.75 ounces. The watch fixes on satellites quickly and by and large seems very accurate. The only exception to that is that it seems a little off in the first mile or so. Thinking about this I have to wonder and will probably research whether this is a result of the quick "fix." Another nice thing about the GPS on this watch is that the display shows to the hundredth of a mile and is updated every second. Which means you know exactly how far you have gone at any point. The final feature of this watch that I want to touch on is the lap/split functionality. Again, on a running watch this seems like a no-brainier but my previous watch didn't do laps/splits at all. Not only does the 610 do laps/splits it can do them automatically based on whatever distance you choose. Again, I found the default set up (1 mile) to be perfect. Not only is this a great feature for analyzing the run when you are finished but since the watch alerts you on every "lap" and displays your average pace for that lap it is a great tool to keep you on your goal pace for the workout. So far this feature has been very helpful to me and I wish that I would have had that kind of feedback throughout this entire marathon training season. So far I am really enjoying this watch. The user interface is intuitive and well designed, the GPS gives the kind of accurate feed back that is helpful and the lap/split functionality is a great motivator during the run as well as a useful tool for analysis after the run. Some more in-depth features of this watch that I am excited to detail in coming posts include interval workouts, custom workouts, virtual racer and the Garmin connect site where you can upload and analyze all of the data the watch collects.